Lots of tree stuff going on this week. Some were scheduled and some were surprises. The tree at the Library Foundation didn’t bring as much money as I had hoped, but – the winner is a FUN co-worker from the library and it will be a real FUN tree planting. I can’t wait to hear where and how he wants to put his tree in the ground. On Sunday Jack and I went over to Westgate Park so that Jack could see the two trees we planted on Susie’s birthday. 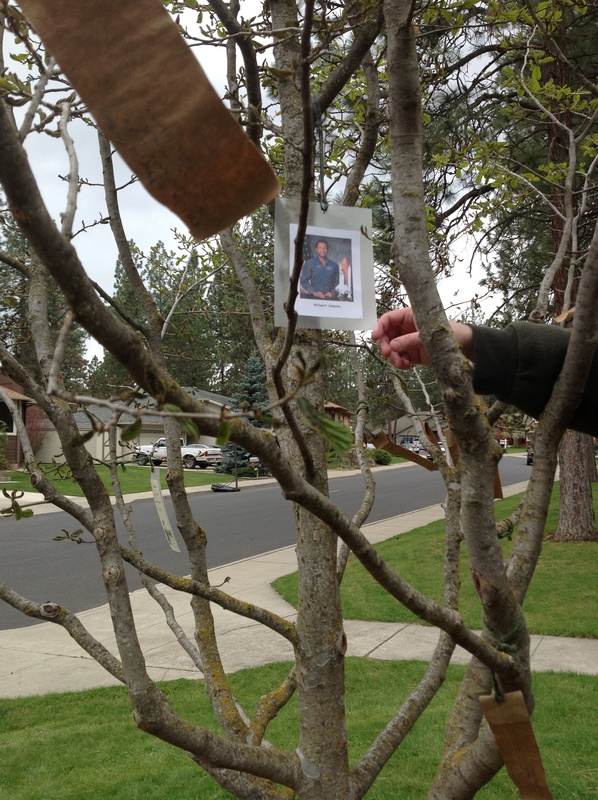 Barbara Anderson had prepared a picture and information about her astronaut son Michael, but it was too large for the laminating material I had brought and I promised I would fix and hang it on our trip to the trees. It was a large piece of paper and so I reduced it so it would hang better and still be readable. While at Susie’s tree I noticed a family walking from the play area to their car and the mother stopped at Michael’s tree and looked quizzically at the tree-grams. So, of course, I started telling her about the tree. “Oh,” she said, “I sang at Michael and Sandra’s wedding.” They will be moving to the neighborhood soon and I told them to watch out for the tree. Sometimes you’re meant to be in a certain place at a certain time. This was not supposed to be a surprise but I was surprised when I looked at my calendar Sunday night and found that I was scheduled to speak at Sarah Blain’s philanthropy class Monday night. Whew! I had enough cookies. It was a great evening just like it was last year and like last year I was pushing for a tree at Whitworth. After all it’s a philanthropy class and it would be an act of philanthropy to plant a tree on campus. What was the most interesting question? Do you sell the cookies? Tuesday morning brought a heartwarming surprise. As I was reading the newspaper the iPad dinged and so I dropped the paper and picked it up and there was an email from the Great Rivers Greenway in St Louis. This was one of the groups that helped me get Susie’s birthday tree planted in the National Park by the Gateway Arch in 2011. At the ceremony I talked about the number of trees in different cities and someone said that they could outplant Chicago and Portland. Well, as of Friday, St Louis will have five trees, Chicago four, and Portland three. There will be a ribbon cutting for the Centennial Greenway and because it’s Arbor Day they will plant four trees dedicated to the four cities connected by the trail – and to Susie who lost her life there. 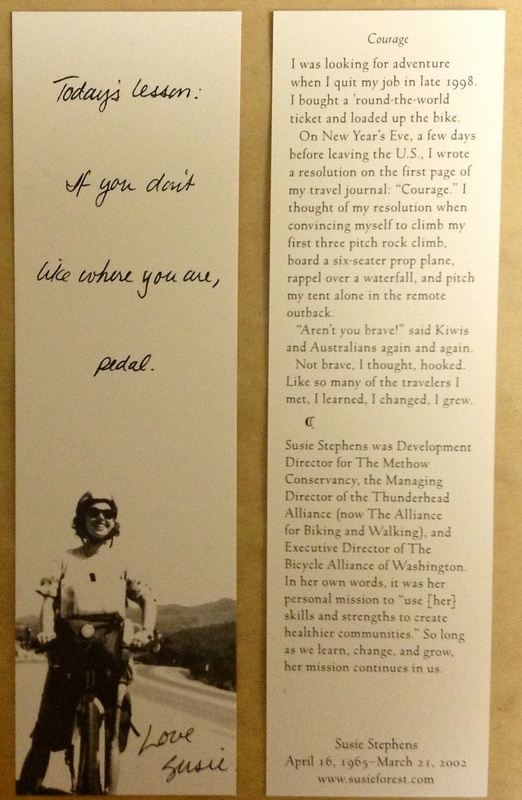 I sent a copy of the front and back of the bookmark so they would have some info about her.